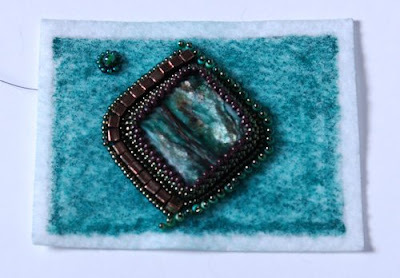 This is another art card for the Bead Journal Project. Green is not a color I normally use in my work, so I decided to experiment with it. I found this cool diamond shaped stone at Artful Bead, my favorite bead shop here is Dallas. I've colored the background in green permanent marker so the white doesn't show through in between the beads. I've used a lot of olive green, some emerald, bronze, and brown so far. I still have some edging to do on the Strike piece, and then I'll post the final product!